Nearly forty percent of the world's 1 billion+ Internet users are wireless. It's a truly staggering fact to think that the majority of these wireless implementations are fundamentally insecure, leaving users and private data at risk. Many wireless proprietors think that the convenience of wireless outweighs the possible risk of insecure impelentation, or that secure wireless is far too complicated to worry about deploying. 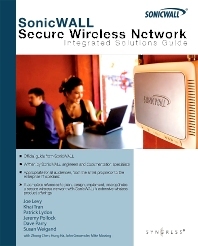 SonicWALL® Secure Wireless Networks Integrated Solutions Guide provides a systematic approach to creating secure wireless networks, using the Plan, Design, Implement, and Optimize model. This introduction to wireless network security is both comprehensive and easy to understand. Using straightforward language, this book describes deployment best practices, what SonicWALL security appliances do, and how they interoperate within an existing or new network. It begins with brief overviews of the theory of risk management, the history of wireless networks, and today’s top five wireless threats. Real-world case studies highlight wireless solution business drivers for education, healthcare, retail and hospitality, and government agencies, as well as their respective regulatory compliance requirements. SonicWALL believes that the days of being forced to accept inherent risk in wireless networking are over. By using modern security standards and sound network design methods, your wireless network should be just as secure as your wired network. Wireless networks can be made as secure as wired networks, and deploying this type of security can be far less complicated than you think. In this book, and through their massive product offerings, SonicWALL gives you (the secure wireless network hopeful) all of the planning, implementation, and optimizing tools you need to do wireless. Securely. Technical management (such as CIOs, IT managers, and value-added reseller management) will find in this book the most complete picture of a fully secure, fully featured wireless network. The Planning and Designing sections describe in detail all of the steps necessary for deploying secure wireless networks that range from simple small offices to full-scale enterprise networks to worldwide distributed multi-site networks. Technical staff (such as network administrators, sales engineers, value-added resellers, support staff, and security consultants) will find complete configuration guidelines for implementing the latest features for SonicWALL's network security, secure remote access, and global management, monitoring and reporting product solutions. In addition to individual configuration sections, this book shows how the individual SonicWALL products fit together to form an integrated, multi-layer secure wireless network solution. Non-technical management will find the Planning and Design sections to be an easy-to-understand overview of wireless technologies and the solutions available for a wide variety of network needs. In addition to addressing the traditional corporate market, this book includes descriptions of the typical wireless networking needs of education, healthcare, government agencies, and retail and hospitality environments. Small-to-medium business owners and those interested in creating personal wireless networks will find in this book all they need to know to determine the needs of their network and get it up and running. SonicWALL's configuration wizards and easy-to-use Graphical User Interfaces (GUIs) ensure that virtually anyone can create a secure wireless network that leverages the latest authentication, encryption, and Unified Threat Management (UTM) security services. Joe is the chief architect behind this book and many of the technologies described herein. As Chief Technology Officer, Joe guided the development of the latest generation of SonicWALL products. Years of designing and implementing solutions for SMB to Fortune 100 companies using products and technologies from myriad vendors led to his drive and determination to enhance the capability, flexibility, and usability of network and security products. He has a number of patents pending for innovations in the areas of wireless networking and firewall technologies. In addition to his engineering work, he has focused on directing SonicWALL’s technical publications teams—believing that technology is only as effective as its users’ ability to deploy it. This focus on clear and accurate documentation led to the development of this book. Khai has more than ten years of experience in networking documentation and works in Sunnyvale, California, as technical documentation manager for SonicWALL. He leads SonicWALL’s technical documentation teams, which has received numerous 5-star reviews in 2008 from the industry’s leading publications and reviewers. Khai was a lead author of Cisco IOS NetFlow Services Integrated Solutions Guide, and a contributing author to Cisco IOS Switching Services Configuration Guide. He has also authored enterprise and service provider network solution guides for Boeing Aerospace and Electronic Arts. He holds a B.A. degree in English Modern Literature from U.C. Santa Cruz, a certificate in Technical Communications, and a Teaching Credential from San Jose State University. Patrick has over five years of experience as a SonicWALL Senior Technical Writer. He has authored over 20 technical guides on UTM, secure remote access solutions, Virtual Access Points, wireless site surveying, and RF monitoring. Patrick has also received an International Photography Award for Fine Art Portraiture. Patrick holds a B.A. degree in Design Studies with concentration in Graphic Design from San Jose State University. Jeremy is a SonicWALL Senior Technical Writer with over a decade of experience in VPN and wireless networking documentation. He was also the lead author of Cisco Access VPDN Solutions Guide and a contributing writer to Deploying Cisco Voice over IP Solutions, both published by Cisco Press. Jeremy holds a B.S. degree in Physics from U.C. Berkeley and a certificate in Technical Communications from San Jose State University. Susan has over five years of network security documentation experience. Prior to becoming a SonicWALL Senior Technical Writer, she worked for over ten years as a UNIX developer, and spent three years as a QA engineer at Cisco Systems and Symantec. At Symantec, Susan authored the Symantec Network Security 7100 Series Implementation Guide and contributed to other endpoint security and network security documents. She is the lead author of the SonicWALL Global Management System Administrator Guide and SonicWALL ViewPoint Administrator Guide. Susan holds a Certificate in Internet Programming and two B.A. degrees in Computer Science and History, both with honors, from U.C. Santa Cruz.